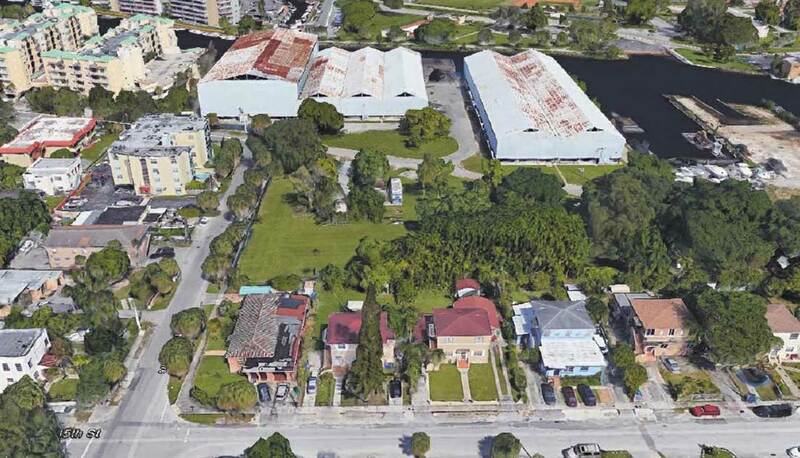 A plan to redevelop a property on the Miami River that has an existing marina has changed at least three times in as many years. The latest proposal would require a rezoning and a loss of scarce marine-industrial zoned property, giving some officials pause. Losing the working river to residential development was a thorny issue more than a decade ago and led to a wave of litigation. Lawsuits were consolidated into one case and settled, basically offering protections for marine-industrial uses on the river. That history was on the minds of members of the Miami River Commission, who on a split vote July 10 approved of the concept of the latest proposal. The site on the south side of the river, at 1583 NW 24th Ave., has been home to a working marina for decades, with some of the structures dating to the 1940s and ’50s. The marina is permitted for up to 45 vessels. Owner-developer Homero Meruelo wants to redevelop the marina and has submitted various proposals, with differing residential components. What began in 2014 as Miami Mega Yacht Marina was changed in 2015 to SeaVault, and changed again in 2016 to Las Brisas Yacht Club. The latest proposal is named Las Brisas Apartments and Marina. The new plan calls for reconfiguring and improving the 45-slip marina, realigning an interior drive and improving it as a public street, and constructing a five-story multi-family complex for 230 apartments. The plan includes a yacht club, bait-and-tackle shop, on-site parking, and a restaurant with waterfront dining. Attorney Jorge Navarro, representing Mr. Meruelo, said public benefits to the latest proposal include a dedicated public easement and access walkway to the river, and a public riverwalk the full length of the property on the river. The riverwalk would connect to an existing riverwalk on the west and with the inland greenway on the east. The entire 9.44-acre property is zoned D3 marine-industrial. The owner plans to request rezoning of the southern portion, about 3.8 acres, to T6 high density residential. The property is on Northwest 24th Avenue and is touched by Northwest 16th Street Road and Northwest 15th Street. “The overarching goal of the proposed redevelopment is to activate this portion of the Miami River by increasing public access and connectivity to this unique natural resource, as intended by the Miami River Greenway Action Plan and the Miami River Corridor Urban Infill Plan, while improving and enhancing the marine related uses at the subject property,” Mr. Navarro wrote. The proposed rezoning and land use changes are solely for the inland portion and would provide a buffer and create a transition from the single-family neighborhood to the south of the site, according to Mr. Navarro. He said a market and economic feasibility study was prepared in June on the latest proposal. “Specially, the site study concludes that the current proposal, which retains a working waterfront on the Miami River with an improved marina and bait shop, combined with a transitional multi-family building on the waterfront parcel, is the only economically viable method to provide public access to the riverfront and ensure the economic viability of the existing marine uses at the subject property in accordance with that envisioned by the Miami River Greenway Action Plan,” Mr. Navarro wrote. Mr. Navarro said Mr. Meruelo intends to preserve the 45 slips allowed in the existing Marine Operating Permit, and as part of a covenant will promise not to seek a reduction in the number of slips. It is the proposed rezoning that makes this latest proposal stand out from prior proposals. The potential loss of marine-industrial zoned land made River Commission Chairman Horacio Stuart Aguirre initially suggest deferring action until a legal opinion could be obtained. The settlement of the river litigation years ago specifically mentioned three properties and the site at 1583 NW 24th Ave. is one of them, according to Mr. Aguirre. Commission members convinced Mr. Aguirre to allow the proposal to be presented. Two condo owners who live near the site spoke in favor of the latest proposal, saying it would be an improvement to the neighborhood. Miami Mayor Tomás Regalado, a member of the river commission, made the motion to approve the concept of the latest proposal, contingent on an opinion from the city attorney’s office that the proposal would not impact the legal settlement. An amendment to the motion was allowed, which said the project should not set a precedent for other similar riverfront properties. The vote was 8 to 3. Bruce Brown of the Miami River Marine Group was one of the three “no” votes. Part of the mission of the river commission and the Miami River Marine Group is preserving and protecting the marine-industrial uses and the working river.